Props to Seattlepi for putting together this comprehensive guide to Cord Cutting. There's been a lot of talk lately about whether cord cutting is really happening or not. I can't really speak to any national trends but I can say with certainty that the majority of my freinds do not have cable. I cut the cord over a year ago and have never looked back. Even with all the new boxes coming out (Boxee Box, Apple TV, Google TV etc...) for me the best way to go is still just a mac mini plugged into my TV. I like and use Boxee, but there's no way I'm paying $250+ for a box that runs nothing but boxee. But if takes boxes like these for the mainstream to start getting web video on their TV's, then so be it. For web-video producers like me, that can't happen soon enough! There's a lot of people out there who think they should be able to get videographers to work for free. Just check the craigslist job board right now and I'm sure you'll find a couple. Many people are positive that the "exposure" you'll get from doing their video will be so valuable that videographers should be groveling at their feet to be a part of their project. Well sorry! If you want professional results, you're going to have to pay for it. ...and there are times when I will work for free. Last month I shot an interview with Justin Carder, for Daisy Whitney's New Media Minute. I didn't get paid, but in this case the exposure was definitely well worth it. My website got screen time in the video, I got a link in all the places the video was syndicated to (including the Huffington Post*), and most importantly, the show is targeted at people interested in New Media, exactly the kind people that it would be valuable to get my name in front of. So while I would, in general, recommend against working for free, there are definitely times when working for free can be a good business decision. Just make sure that the exposure you'll be getting is worth the time and effort you put in... and remember that most of the time, it's not. Here's the episode. She introduces me/ my interview at about 1:12. * I even have my own tag on Huffington Post now! Although I appear to be sharing it with my google page rank arch-nemesis, Nuclear Non-Profliferation Expert David Albright. We Won! I spent the day yesterday editing videos for our Victory Celebration at KeyArena. The whole day was kind of a surreal experience. I spent all day slogging through the videos ... I had to put together 3 videos to ReCap the entire season, and I had one afternoon to do it. Towards the end it was definitely feeling like a chore. Honestly, I just wanted to get the day over with so I could get some rest after weeks of non-stop work. I got to KeyArena, loaded the videos, and then walked outside and was (for some reason) surprised to see the sea of people waiting in the rain for the parade and celebration. After spending the day in the nearly empty Storm office with a couple of stressed out and hung over Storm staffers, it was just such a sudden shift to all of a sudden be surrounded by a mob of excited fans. I don't know how many people were at the parade, but we estimated there were around 5,000 in the arena for the celebration afterwards. Watching those videos with the players & fans in KeyArena, and having it capped off with a huge confetti drop was one of the best moments of my professional life thus far. By the time it was over I was completely energized and could've kept going for hours, which I did, at the after parties. I also found out (after the fact) that the videos were being broadcast live on Northwest Cable News, along with the rest of the ceremony. So the trend continues... where the videos I spend the least amount of time on get the most attention! Here's their broadcast... which is really just a straight feed of what we had showing live on the jumbotron. From Left to Right; On-Court Entertainment MC Shellie Hart, Storm Staffers Matt Heuer & Shannon Burley, and Me. I just produced a video for a new ride sharing service Zebigo. The idea seems pretty solid if they can get enough users, and as more people are choosing to live car-free I'm sure the ideal will catch on. But one thing they're already doing right... they're using VIDEO. Obviously I'm a little (or maybe a lot) biased here, but for me there is no better way of introducing a business or concept to consumers than a video. We've entered the age where Every Company is a Media Company and there's no turning back. If you're goal is to make a connection with your audience, video is clearly the way to go. Some exciting news on the CHS front, we got our first CHS-V advertiser! Healeo has been advertising on CHS for a while now, but they've decided to move their advertising specifically to my video series there. 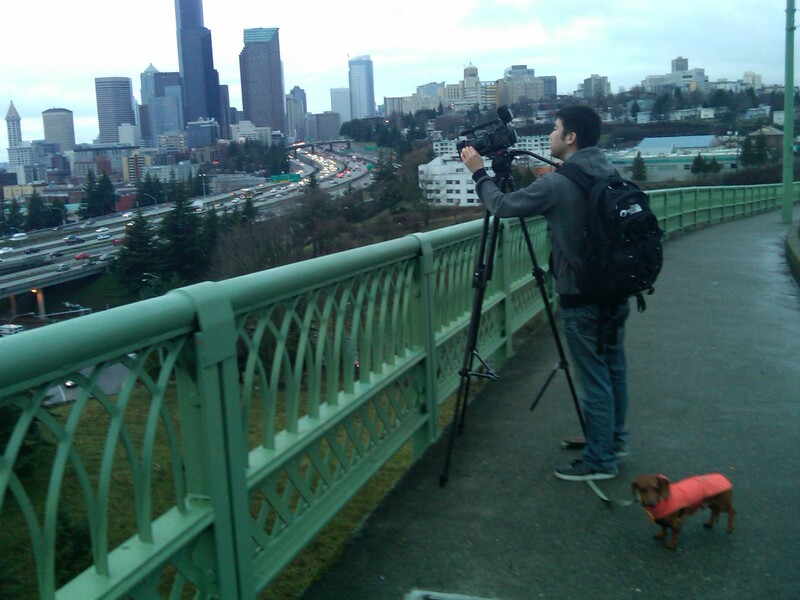 CHS-V is already building (and engaging) an audience by delivering timely, ground level video journalism and documentary-shorts focused on Capitol Hill. I know that Capitol Hill is an attractive market for advertisers, so if hyperlocal ad-supported online video can work anywhere, it's here. For ad supported video to work, obviously, I'm going to need to get views. In this case that will often mean attracting viewers beyond just this neighborhood, and even beyond Seattle. Lucky for me, Seattle and Capitol Hill specifically are centers for innovation and creative minded people, so I know finding topics with wide appeal won't be a problem. Past episodes of CHS-V have already been featured on national and international blogs, and are regularly featured on various city-wide blogs, and even film festivals. Any ad messages would be carried through all theses mediums. I'm still trying to figure out the best way to integrate the ads into the video. The only thing I know is, I DO NOT want pre-roll ads before every video. If I'm not that interested in the video, pre-roll ads can be a deal breaker, and I'm sure I'm not the only one who feels that way. This is my first shot at integrating ads into my work so I'm sure there'll be some trial and error but I'm hopeful that we can make this work. 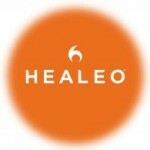 Below is the first video with the 'presented by Healeo' post-roll at the end. Tomorrow, I plan on testing out a more prominent (but hopefully not intrusive) ad placement. If I ever catch you cropping my credit again... UPDATE 6/29/09: I've started posting videos to the Storms Official Youtube account, so people won't have any reason to rip off crappy versions any more... And also, on the advice of my dad, I want to point out that the picture in this post is me messing around with a prop gun on a movie shoot in LA! I mean really... 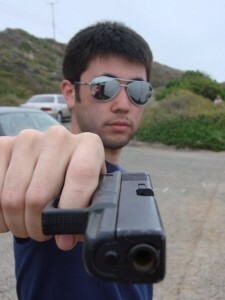 I'm a Fairhaven educated Seattle liberal who makes Doppler skits for a living and documentaries about Obama Art for fun... so don't worry, I'm not a scary guy and I promise I won't shoot you. ------ Just discovered that someone on youtube has been ripping videos (off my personal website, and off the Storms website) and posting them on youtube. I wouldn't mind if I were credited, and if the videos didn't look like CRAP, but I'm not and they do. I'm all about freely sharing content... all my personal videos are licensed under the Creative Commons, as opposed to full copyright, but it's only fair to credit whoever made the content you're sharing. The Doppler & Sue Bird skit is only available one place online, the Storm's Video page. The version on there ends with "Shot and Edited by David Albright," but this guy went through the extra trouble of cutting off the credit at the end of his ripped version of the video. WHY?! It also baffles me why you'd go through the trouble of posting something that looks SO BAD, what is that video like 2 frames per second? So people... feel free to share my videos. Everything I have online is fully embeddable to make it easy for you to share it. But please, don't try and do screen captures of my videos if you don't know how to do it correctly, and definitely do not crop off the credit at the end of the video. No one is going to believe that you made it yourself anyways. Joy Moeller – EditQuette from Art+Copy Club of Kansas City on Vimeo. Funny video for anyone who's ever edited with a client. I love #10. I'm sure any editor could put together a list like this, and I bet they would all look pretty similar to this one.